Note: iRocker released an updated model of the Sport. Here is my review of the 2018 Sport. 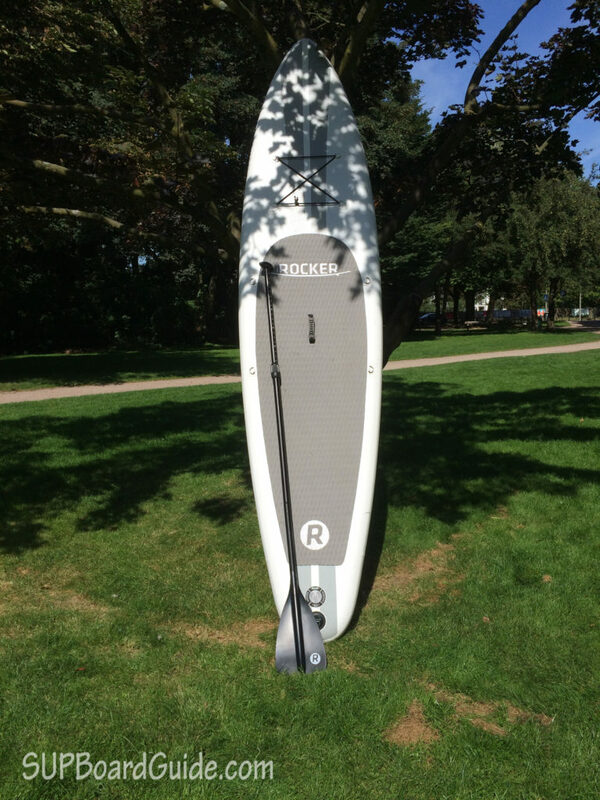 The iRocker 11′ Stand Up Paddle Board is a high-quality inflatable paddle board that feels like a hardboard. One of the perks of running SUPBoardGuide.com is that I get to test a ton of different gear. I’ve tested a bunch of amazing boards over the last three years, but a board I was particularly interested in was the iRocker. The iRocker is one of the most popular and talked about boards in the market. Since I live in Europe, however, I never got to check it out. So, when the guys at iRocker told me that they now ship to Europe as well, I wanted to scream my lungs out in excitement. Then, it got even better: They asked me to review the iRocker. 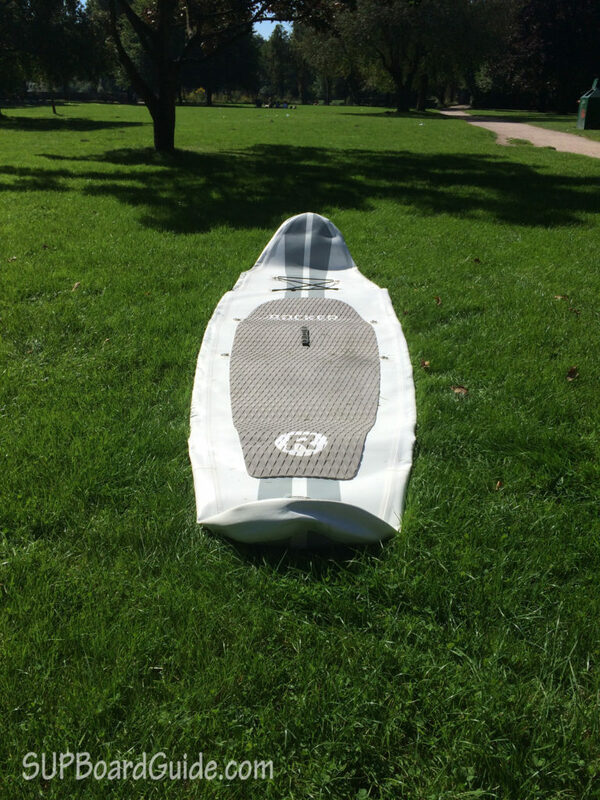 The iRocker is an inflatable paddle board, yet it feels solid like a hardboard. To ensure premium quality and durability, military grade PVC is used to create the inflatable SUP. The board looks tough with an elegant flourish, and comes with a complete kit when you purchase it. 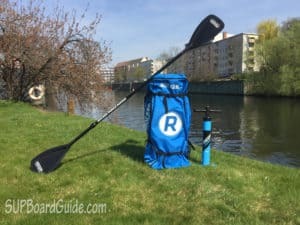 The kit is composed of a dual action high-pressure hand pump to inflate the SUP in a fast and easy way, an adjustable paddle made of aluminum, a repair kit, and a carry bag to make it easier for you to carry the deflated board wherever you go. Inflating and deflating the board is easy. It comes with an ultra-efficient dual action pump. It’s definitely one of the better pumps on the market. Even though it only has one chamber, the pump is just as good as the Titan Pump by Red Paddle Co and way better than some of the cheaper pumps out there. The dual action system will basically allow you to pump air into your board during the push down and the pull up, meaning there is no wasted motion. The integrated pressure gauge starts registering pressure at approximately 7 PSI (around 120 pumps). Once pumping gets too hard, you can remove a little screw and switch from „High Capacity“ to „High Pressure“ and continue inflating the board. Pumping it up to the recommended 15 PSI takes about 200 pumps and took me around 5-7 minutes. Once the fin is attached, you’re ready to get on the water. Deflating the board once you’re done is even easier. You just open the valve and push in a little pin, then roll up your board and store it away in the bag. Although this inflatable stand up paddle board is more affordable than its peers, I was really impressed with the high quality and great performance. Only materials of the highest quality were used to make the iRocker board, like the military grade PVC i mentioned above. It has an internal triple layer of drop stitch core that is six inches thick to make sure that it is stable and more rigid than other inflatable paddle boards in the market that are only four inches. When choosing a paddle board, just remember that the thicker the board, the more stable you will feel. The iRocker also has a groove deck traction pad that is made of non-slip EVA to help you keep your feet in position. You can choose between the blue and the white board. Both are designed really well and remind me a bit of a retro style race board. It also comes with some nice added featured like a bungee cord to bring a deck bag and an extra D-Ring. The overall quality and look of the board isn’t that of a $600 board. If somebody had told me it’s $1000, I wouldn’t have been surprised. At the beginning of the review, I claimed that the iRocker performs like a hard board and it really does. I never pumped it up to more than 15 PSI and am really impressed by the performance in different conditions. The 11’ version I tested (there is a 10’ version) is stable enough for anyone just learning to paddle board, yet fast and versatile enough for advanced riders. The board also tracks really well making it easy to go in a straight line if you’re a beginner. The 2+1 fin setup composed of 2 smaller fins and 1 large detachable fin (check the picture) really works well. The bounciness you usually see in inflatables is minimal, and the board glides well. At a 30“ width it’s stable yet fast compared to other, similar boards. 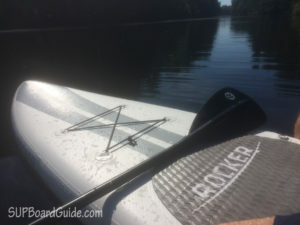 I’ve tested it in different conditions and the iRocker SUP never disappointed me in any way. It has a weight limit of 385 pounds which should be enough for most people even if you want to bring some gear or have your kids hop on. So far I’ve only been praising the iRocker. However, there are two things that I didn’t like that much. The paddle that’s included is fairly heavy and not as high quality as the board itself. The top part has a turning mechanism to hold the handle in place. When I took the board out for a few hours, it sometimes got a little loose after a while, and I had to readjust the paddle. That being said, given the price point, it is nothing to complain about, but I still wanted to point it out. If you’re going to SUP a lot, a new paddle is one of the first things you want to buy anyway. The ones included in packages like this are always fine to get you started, but that’s about it. The backpack included is pretty rigid. The material looks like it can definitely withstand most travel. 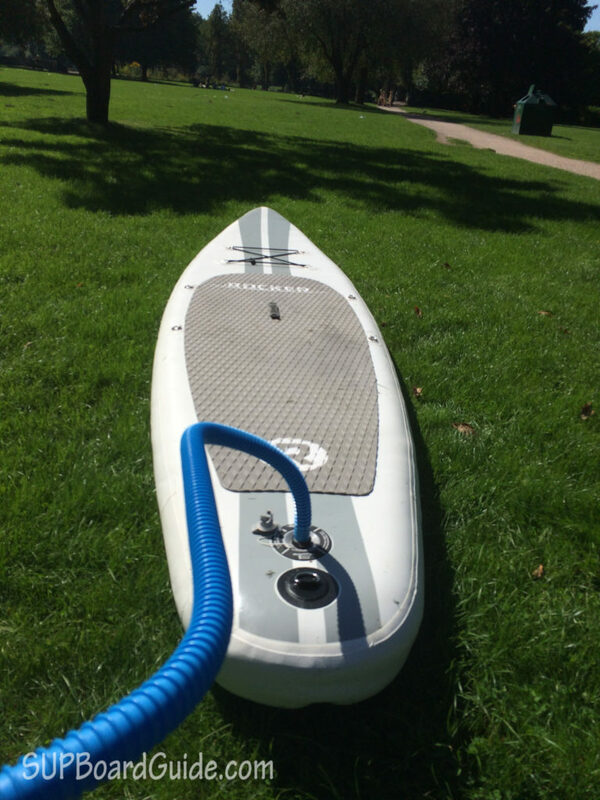 The board will fit without much hassle, and you can also fit the pump and paddle. The padding and zippers, however, are not quite as good. If you throw the bag in the trunk of your car, you won’t have any issues. 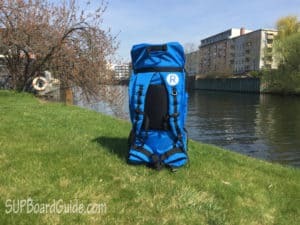 If you’re going to carry the backpack a lot or want to travel frequently, definitely look into buying the new backpack. It’s the upgraded backpack and has better padding making it more comfortable to carry as well as extra handles, roller wheels, and pockets. 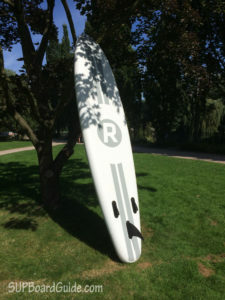 The iRocker paddle board is an inflatable SUP made of quality materials. It was built to last, and you will have fun for years. It’s backed by a 2-year warranty, and the customer service is just fantastic. It comes at an affordable price, and the entire family can enjoy it. I recommend it for anyone looking for an all-round board that comes at a reasonable price and is beginner friendly. I can’t think of a better board in this price range. 5 Stars! 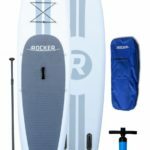 Update: I included the iRocker in my article about the three best inflatable paddle boards of 2017. If you’re interested in the iRocker check it out on Amazon or buy it directly on their homepage. The normal iRocker still comes with the old backpack. However, you can upgrade to the new backpack here. If you intend to travel with the boards or carry it for an extended period I highly recommend you get the new backpack. The paddle can also be upgraded to the fiberglass version, or you can go all out and get the carbon fiber paddle if you really want to treat yourself. The Cruiser is as the name suggest you’re perfect cruising option. It’s extremely stable (33″ wide) and perfect for beginners that are still a little wobbly on their feet, to bring your kids/dog or try some yoga. I wrote a full review here. The two boards in the middle are the All Around 10′ and 11′. Both are basically the same shape and style board as the original iRocker Sport. However, they have a slightly wider tail making them more stable and are also 2″ wider. That means they are less of a touring board and more of your typical allrounder that some people have been missing. You can read my review here. I got one for Christmas and really like it so far 🙂 It’s really easy to maneuver and doesn’t feel wobbly at all. Just waiting for the weather to get a little better so I can use it more. It’s a great board! I’ve been using a friends for a while and bought my own now just in time for summer. The performance is great and you don’t feel that it’s an inflatable at all! The look could be a little bit sportier but that’s just my personal opinion. It’s a great board for beginners and advanced SUPers. My wife and I both got one and are really happy with it. Inflating it is super fast and easy. It’s best in flat water but I did surf a few smaller waves with it as well. Hi Stephan. It should be back in stock in about a week. iRocker seems to have some trouble keeping up with the demand 🙂 I will reach out to them and confirm that it will be available again soon. Is there a difference between the blue and white board? They are exactly the same. There is a 10′ version though. 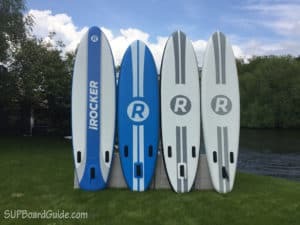 Hi, between the Irocker and the Solstice Bali both inflatable paddle boards, which one would you pick? I’m looking to buy my first paddle board. Both are great to be honest and you won’t regret buying either one. If I had to chose I would go for the iRocker though. It’s a little more stable and you can feel the extra 2″ in thickness. It’s slightly more expensive than the Solstice but worth the money in my idea. It’s also currently off $100 on Amazon. Thanks a lot I will go for the Irocker then. Any thoughts on iRocker vs Isle Explorer? Also what considerations would lead someone to choose between 10′ or 11′ iRocker? The ISLE Explorer is only 20lbs. The 11′ iRocker is 30lbs. You will definitely feel that weight difference. The ISLE is also 32 inches wide (the iRocker is 30). The wider the board the more stable it is. Both inflate to 15PSI and both are great boards. You can’t really go wrong with either one. When you decide between the 10′ and the 11′ one keep two things in mind. The weight the board has to support and how experienced you are. The 10′ can hold up to 350 pounds so even when you carry some gear that should be plenty. The longer the board the more stable it is. So if you’re a beginner and over 5’8 definitely go for the 11′ board. It’s of course a little less versatile as well but it will give you the stability you want in a first board. Another one you might want to consider is the Red Paddle Co 10’6 Ride. It’s really popular here in Europe and in my idea really underrated in the US. You can get it on Amazon though. I will publish a review in a couple of days. I just took some pictures today. Hi – Love these reviews. It’s July 2017 – Is there still a coupon I can use to buy the iRocker 11′ Sport? Sorry for the late reply. There are currently no coupons but the boards are discounted on the iRocker Homepage. No further discounts though. I don’t think there will be any significant discounts before Black Friday. I broke my fin when I hit a rock. Do you think I can get a replacement? Yeah you can get buy a replacement on http://irockersup.com. I think it’s about $20. This board is awesome! Every time I get out on the water I get stoked that I went with the iRocker. The construction is definitely top notch as we have abused this ours to no end. I went with the 11′ due to length and ability to have my son on board with me. The stability when we ride together is great – Sometimes he has to sit down and paddle but both of us are able to get on board and explore together. He asks me non stop “can we go paddle boarding today?” Nothing but thumbs up for the iRocker. Hi guys! Would you recommend the iRocker 11′ for a first timer like me? Hi Ceazar, Yup I would definitely recommend the iRocker 11′, it offers great stability and it is easy to maneuver for beginners too ? do you know if a there is a ringlet on the board for a surfboard leash (for the iRocker 10 / 11)? Thanks! Hi. Im a newbie to SUP’s, but I’m an athletic 71 years old, 6’3″ and 250 lbs. Im in a quandary. I have an opportunity for a good deal on a Bic Wing, 12’6″ with a price comparable to the iRocker. I’ve been leaning toward the iRocker but a friend who paddles is pushing a hard board and as a former surfer I have a hard time arguing against him. Given the above, do you have a preference either way. Use would likely be flat water but small surf appeals. – Do you plan to travel with your board? Getting an inflatable would be a huge advantage. – How far do you have to carry the board? The iRocker is lighter. – If you plan to hit the waves get the iRocker. The Bic Wing is a proper touring board and you won’t have much fun with it trying to surf. However, the BIC is the faster board. It’s perfect for flat water. Performance wise hardboards are still slightly ahead of inflatables. If you can get the BIC Wing for a price similar to the iRocker that’s an absolute bargain. Unless you plan to travel or surf with the board I’d say go for it and let me know how you like it! How do you choose between the 10′ or 11′ version? What things should I considered or do you recommend one over the other? The most important factor is really your weight, height and skill level. The iRocker is actually really stable at 30″ and great for people that are tall. If you want something even wider that’s super stable check out the 33″ wide Starboard Atlas. Thank you for the reply. Surely buy irocker. According to my physical characteristics what would you buy, the irocker 11 “or the new irocker cruiser 10” 6 “which is a bit wider? That’s really up to you and what kind of paddling you prefer. Both can hold up to 350lbs so there is no issue there at all. The new cruiser will be a little more stable which will help you out in the beginning. The regular 11′ one will be a little faster if you want to cover some distance and get more out of every paddle stroke. I’d say go for the new one if you want a little more stability and are looking for relaxed cruising. If you think after getting used to it you will want to cover some distance and go a bit faster as well get the 11′. Sorry that I can’t tell you more about the cruiser. It’s brand new and I’ve not tested it yet. iRocker was nice enough to send me one so an in-depth review will definitely follow in the next few weeks! Thanks for the advice. Surely I’ll buy the cruiser. Hi, great review! I am looking at purchasing two of these. They will be for me, 5’7″ and 150lb, and my wife, 5’0″ and pregnant! Ill leave her current wait out of this ha ha, but i suspect she will drop to the 120-130lb range after the baby. Maybe a little more for a bit. I grew up wakeboarding, and have some SUP experience, as does my wife. My daughter may tag along for rides, but she is just a toddler. Our riding will take place on a fairly calm lake. I am a little stuck on my options. Initially I was going to go with two 11′ boards. However, I am now considering one 10′ and one 11′. Any recommendations? Also, how much of a step up is the Surftech saber? should i consider replacing one of the iRockers with one of them? The Surftech Saber is quite a step up. It’s not an inflatable and twice the price so yes, the performance will obviously be better than the iRocker’s. I briefly cover the Saber here: https://www.supboardguide.com/best-sups-to-cruise-waves-summer/. And Isle did a pretty cool comparison of hardboards vs. inflatables here. That being said the iRocker really is a great board. It is beginner friendly but not at all a beginner board, that you as a sporty person will get bored of after a short while. It’s great for a casual Sunday cruise with your daughter or a longer tour by yourself. Let me know what you decide on and how you like your new board! Great! Thank you for the reply! I will let you know! Decided to go with two iRockers! I appreciate the advice! Do you think I should go with a 10′ as well, given that I am 5’6/5’7, and 150lb? The heaviest I seem to get when in shape is around 160lb. I cant seem to find any info that breaks down board lengths by height/weight. Thanks again, you guys have been a big help! Glad to hear that we helped you out! Given that you used to wakeboard and have some SUP experience I’d say go for the 11′. A longer board will be a little better at higher speeds and you will be just fine maneuvering it. Plus you will have some extra space for your daughter, even when she’s not a toddler anymore. Thanks for the help again! A 10′ and 11′ iRocker it is! Hi! I’m want to buy an inflatable paddle board for my wife and I (sharing the board initially), and with the great all around reviews, I’m leaning towards iRocker. We are somewhat beginners (4x only on a SUP), she’s 5,7′- 120lbs, I’m 5,10′ – 160lbs. We would use it to ride on mainly flat water, sometimes bringing our daughters (about 30lbs each) or riding the two adults together + I know she would like to do SUP Yoga . I was initially looking to get the irocker 11′ but they have now an All-around 11′ that is 32″ wide which I assume would be more stable for her to do yoga, but was wondering if(1) the “regular” 11′ at 30″ wide would be stable enough for Yoga,; (2) if the 11′ would be to hard for her to maneuver at 5,7′ so need to get a 10′. I also saw the Cruiser, but I’m afraid we’ll loose on speed and maneuverability. It seems the new All-around 11′ would be the best compromise, but I would really appreciate your take on this. Thanks in advance! If you’re looking to ride with 2 adults or bring your two daughters along I’d definitely go for the 11′. The regular 11′ board reviewed in this article isn’t really ideal for yoga. The cruiser would be perfect for yoga and it will be maneuverable but indeed will be a bit slower. I’m still waiting for the new all-round board but from what I’ve heard so far and from what the guys over at iRocker told me the board would be ideal for you. It is similar to the regular 11′ board but is slightly wider to add extra stability. Should be the perfect mix of speed, size and stability. Thanks a lot for your prompt reply! It is always reassuring to get additional feedback. 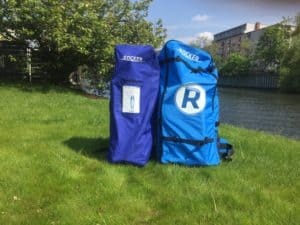 Any other brand /type inflatable SUP recommendations similar to the iRocker All-around 11′ you would have for me? Thanks again! I think the iRocker is probably the best choice given that you want to use it with two adults or bring your daughters. It can carry up to 300kg which is industry leading. The reason is that it’s 6″ thick while most other inflatables in the 11′ Touring range you’re looking for are 4.75″ thick. That means you’d have to get a longer board. A really quick option is the Red Paddle Co Sport 11’6″. It has the same width but is a little more unstable than the irocker due to its shape. With the discount iRocker currently offers you’d also have to spend an extra $1000 though. Most other options like the Ten Toes, Red Paddle Co Ride or Starboard Atlas wouldn’t be as fast as you’d like them to be. Don’t hesitate to ask if there is anything else I can help you with. Can’t thank you enough for your help! Great board! Fast, Stable, and Durable! Buying my first board, I’ve only rented in the past. Someone told me to check out the iRocker and I found your review. Was wondering if I could get your advice? I’m about 285 lbs, 6’2″. I’ve been leaning between this 11′ iRocker and either the 11 or 12′ isle explorer. Obviously you will probably lean towards the iRocker, but could you offer some advice aswell as whether it would work well for someone my size? both boards are fairly similar. They have the same fin setup and a similar shape, both are 6″ thick. The Explorer is 2 inches wider making it a bit more stable but of course a little slower as well. It also has an extra bungee cord at the rear. Both are great boards and can totally be recommended. What you have to keep in mind is the weight limit. The 11′ Explorer is not an option and the 12′ is cutting it fairly close. Longer boards also tend to bend in the middle at higher weights. Since I’ve not tested the new Explorer version, I can’t speak to its stiffness. The iRocker, I know, won’t have that issue. Another board you can check out is the Tower Adventurer 2. It’s 10’4″, is in the same price range and has a weight capacity of 350lbs-400. Hope that helps and feel free to reply if you have other questions. Thanks for replying! My main concern has been the weight limit on these, exactly. For the most part, boards aren’t made with someone of my size in mind, mainly smaller people with gear or tandems. I understand the whole less width/longer board= faster bit. I seen something where someone measured the iRocker, and it’s actually 10’6″ instead of 11. From the few times I’ve rented boards, I know I had an easier time with the longer boards. Do you know of any slightly longer boards that are equal quality/ weight capacity? I noticed you did a review on the tower xplorer, but I think 14 would be a bit too long. No problem. You’re right, most boards are not really designed for someone your size unfortunately. I did review the 14′ Tower but didn’t suggest it because I agree that 14′ would probably be a bit too long for you. Both are a bit more expensive though. Looks like I may have to compromise and go with a shorter board for now just so I can get back on the water (And maybe lose some weight and work my way to different boards!). I definitely need an inflatable, as there isn’t a single wall in my apartment long enough to store a hard board (I measured). As for the iRocker, I looked again and I’m sure it’s as labeled. It was in an amazon review where someone measured, with a photo, and I just noticed iRocker replied and mentioned he may be measuring incorrectly. Definitely looks like I may go with this board, I like it’s look and that it’s slightly narrower than the isle board. This will be a nice starter until I can get my weight down within the ranges of some other boards! Thanks a lot for all the advice, you have a great site here with a lot of awesome tips! I think you will enjoy the board! The iRocker is a great starter board. I am looking for some help in choosing a board for me. I am 6’5″ 240 LBS. I recently bought a Costco Wavestorm 9’6″ soft top board and tried it in some choppy waters in a lagoon and found it to be very unstable and low in the water even though it states to be up to 275lbs. I want to do a mix of flat (or choppy/windy) as well as some surf in San Diego. Not looking to shred the waves, just want something I can cruise around on and catch some small waves (3 feet and under) for fun. I am a beginner, no surf experience and only a few times on paddle board. I am worried the 11′ would be too long for the surf so leaning towards the 10′ sport but I also like the idea of the all-arounder. Any suggestions? Thanks!! Sounds like the iRocker would definitely be the better choice for you. The 10′ would be easier to maneuver, yes. However, at 6’5″ I’d definitely go for the 11′. You will appreciate the extra stability you have in all conditions. The all-arounder is really similar but is 2 inches wider for extra stability. It won’t be as good in the surf and will also be a little slower but of course more stable in all other conditions. It still has a sporty shape, but 2 inches can make a big difference speed wise in my experience. I haven’t tested it on the water yet It should arrive in the next few days. Tim, I would definitely not suggest the 10′ Sport iRocker considering your size. Unless you are a more experienced paddler this board will feel a bit unstable for you. In fact I would suggest taking a closer look at the new iRocker All Around SUP. The All Around is going to offer the stability that you are looking for but will still to a pretty good job surfing small waves like you are looking for due to the sporty shape. The 11′ All Around would honestly be your best choice. Awesome, thanks for the advice! I have been on the fence between the 10 and 11′ for a long time. This helped a lot. I went ahead and ordered the 11′ all around, I think it will be perfect. Give’s me a lot of flexibility if I want to get the seat for it and cruise around La Jolla cove as well. Once I get better (and more money 🙂 I’ll look into a more dedicated surf rig. Have you tried the Quroc QI Crossover? Do you know how the iRocker Sport compares to that? Hi Richard. I’ve never tried the Quoroc so I unfortunately can’t tell you anything about it. the 10′ will be perfect for your height. You can easily bring your kids along or they can even paddle themselves. Am I better off with the irocker sport with a 30″ base or the all around model with the 32″ base? the Sport is noticeably faster. However, since you’re a beginner and want to take your kids you will need the extra space. You will also feel a lot better in surfing small waves with the all around. One last question… what are your thoughts of the Cruiser vs the All around? It seems to be 10’6″ vs the 10′ for the All Around. Just worried that the 10′ All Around will be too small. the Cruiser definitely offers a bist more space. The All Around is definitely bis enough to take one of your kids though. If you want to take it really slow and maybe try some Yoga every once in a while as well then the Cruiser is for you. Since you want to take it to the beach and it sounds like you might to for a longer paddle I’d sag theAll Around really is the better choice. Hi, I am looking to buy both my wife and I an irocker board. I am 5’6-7, 160lbs (very athletic and only 23) and my wife is 5’1, 112lbs (also in good shape). I have very good balance and would really appreciate the speed from the sport version; however, the all-rounder may be better as it could increase its versatility for me. I will primarily use this on flat water rivers/bayous and occasionally in a large lake that has some pretty sizable waves on a windy day (I would like to surf with it, but it will be its secondary use as I wont be in waves too often). I would also like to fish on it sometimes (bring an ice chest to sit on, etc.). Lastly, it would be nice to have the option to bring friends with me (much less often than riding solo). Secondly I would like for my wife to be able to take a passenger with her as well, but I want to make sure that an 11′ wouldn’t be too large to maneuver (she would also partake in the activities mentioned above). So which boards from the sport, regular, and all-rounder line should we go with and what size? Thanks in advance! sounds like the All Around would be ideal for you. It is the perfect allrounder and since you want to use it in a variety of conditions it’s the better fit than the Sport. The Sport is a little faster but just not nearly as versatile. It also won’t be stable enough for fishing and, it’s not designed for surfing and an ice chest wouldn’t be as easy to transport. I wrote a full review of the All Around 11. The 11′ is definitely the size you want to go for. The length will also give you some extra glide so you will still be able to go reasonably fast while it’s obviously not a race board. Get the 10′ one for your wife. At 5’1 and 112lbs the 11′ would be a little too much to maneuver and the 10′ can still carry enough weight to bring an extra person. You also get a pretty sweet deal if you buy a 2-board combo on the iRocker homepage. 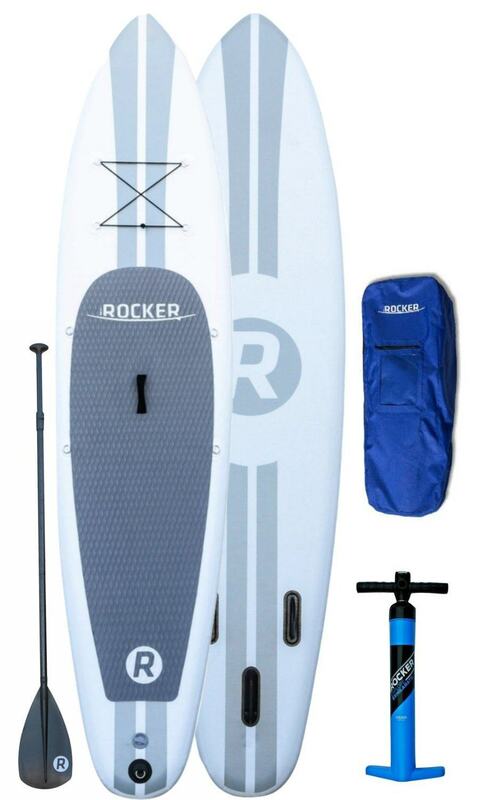 I have read several reviews and decided that IRocker would be my choice for an inflatable paddle board. It’s just that I would like to receive some help in terms of choosing the right fit and board for me. I am quite beginner (I have done it twice, yet was able to stand up well on first trial already). I plan to use the board in the sea as well as rivers and lakes here in Australia. I am 173 cm tall and weigh 72 kg. I woud like to invest into a board that I would be able to use forever, so wouldn’t want to get a beginner board that I would soon want to replace. I am planning to mainly use it for solo rides, so I have decided that the cruiser is out of picture. Yet, I can’t decide whether all-around or sport and whether 10′ or 11′. Could you please let me know what would be your suggestion? I’d suggest you go for the All-Around. It’s a little more stable than the Sport and better suited for the sea and chop. It’s not as fast as the Sport but at the same time still perfectly suited for longer trips and it comes with the better accessories and gear. Hi. It depends a little on what you’re looking for. The iRocker’s design is a little sleeker and it does come with an excellent pump which used to be Red Paddle Co’s big selling point. The Red is higher quality though. It’s lighter meaning it’s about as fast as the Sport even though its shape is more of an all-around shape. The Red also has a thruster fin setup. The iRocker comes with a large center fin. That means the Red is easier to turn and can be used in the surf but doesn’t track as well as the Sport. Depending on how old your kids are the handles in the front of the Sport might be a factor too. They are designed for kids to hold on to. Another often overlooked but really cool board is the ERS Skylake. Sarah reviewed it recently here. I have an 10’6″ long x 31″ wide x 6″ thick Peak iSup, but I’m looking to get another one that may be better in the surf. It seems that iRocker recommends the Sport model for surfing, yet you seem to recommend the All-Around for surfing. Can you comment on that? I find that the Peak that I already have is super stable on flat water, but not so much when I tried to take it out surfing. I didn’t actually ride any waves on the one time I tried, since the conditions were not that great. However, I noticed two things: (1) It was hard to balance in the choppy conditions that day (but I think I just need to get more practice) (2) It seemed like the board would be unresponsive in the waves and not really that fun to surf. It seems that if I get I iRocker for surfing, I would want the Sport for performance, but the All-Around for stability. Please let me know if you have any thoughts and can compare the iRocker models to the Peak board that I already have. So personally I recommend spending a few extras dollars if you’re intending to get a bit of surfing in. The ERS Skylake is a way better SUP to be surfing on. The stability thing in surfing just comes with practice. Getting a more stable board will generally hinder your surfing abilities. While we do say the All-Around and Sport is suitable for surf, they both aren’t nearly as versatile in the surf as the ERS. Red Paddle Co Ride is another great option but if you plan on cruising around lakes and rivers as well, the Skylake is going to be your best bet. 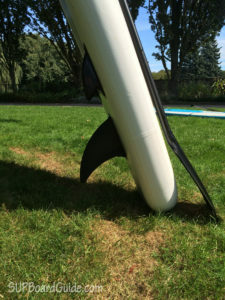 Only because you can setup your fins with a large single fin for cruising and then switch it over for a smaller fin so you can have a thruster setup for manoeuvrability on the waves. The ride has fixed fins.